The latest brand to cause a stir on Irish shores is RICH, which has been doing wonders for those of us with dry, coloured or damaged hair. The brand seeks to offer a luxury haircare experience at affordable prices, which is a pretty appealing concept. I’ve tried this stuff and it’s the business: it’s silicone rich and will smooth and soften even the unruliest of manes into sleek submission! But don’t take my word for it – here’s your chance to try it for yourself. I have 5 sets of RICH Pure Luxury Argan Colour Protect Shampoo, Conditioner and Rejuvenating Argan Oil Elixir to give away, worth €25.97 each. This clever trio will protect and strengthen your hair – the shampoo and conditioner contains argan oil along with wheat, corn and soy proteins, to strengthen and moisturise dry, damaged hair. Meanwhile Rejuvenating Argan Oil Elixir helps calm and smooth frizz-prone hair and delivers a glamorous level of shine. Plus, all the products are heat, UV and colour protective. Open worldwide, the only condition of entry is that you follow Fluff and Fripperies on Bloglovin’ and leave a comment below – though you have the option of picking up some extra entries if you’d like. Just follow the simple steps in the widget below. Good luck everyone! You’ll find RICH in chemists nationwide, or online at Beauty Features. For more info, check out the RICH website or Facebook page. Oooh goody! I've been looking high and low for this stuff and cannot find it anywhere in Dundalk. I have dry, damaged AND coloured hair - all three. I need this! Just what my hair needs! I have not heard of this brand before... Thanks for opening a giveaway internationally, lovely gesture! My hair is sleek and doesn't need any more smoothing, but good luck everyone! oh would love to try these, hearing so many great things about them!! I would love to try these coz i have got Dry, damaged and colored hair. Thanks alot for this chance. Cool I'd love to see if argan oil can really revitalize my hair! I've heard so much about Rich, I'm obsessed with hair care! I've seen great reviews on this brand, would love to try it. Fab giveaway! I am always searching for the perfect shampoos/conditioners, would love to try these! I would love to try this,my hair needs strengthening! I have heard a lot of good things about this range! Yes please! new highlights so badly in need!! count me in as RICH Hair rocks! I am a recent convert. Someone gave me a bottle of there hair oil, It has completely tamed my frizzy tresses. No one ever compliments my hair but now everyone is commenting how sleek and shiny it is! Lovely giveaway thankyou very much! I'd love to give these products a try. My hair is so curly and frizzy, normally only John Frieda Frizz-Ease can sort it out! I have never heard of this brand before, the products sound great! Such a great giveaway. Thanks a lot, they look amazing! Get in my life NOW! Thank you for the great contest! This would be great for my hair! I would just love to try this. 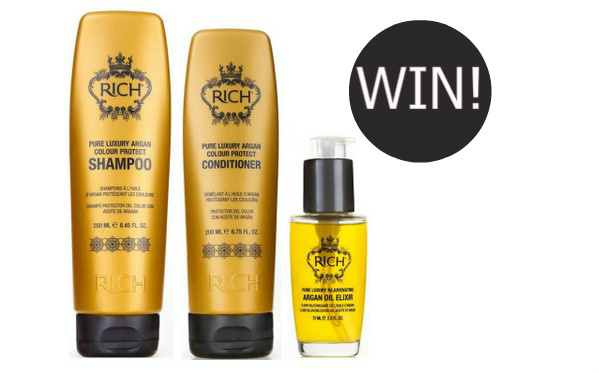 I have heard of Rich hair products as I tried to win some of their products on their facebook page lol! I keep meaning to get some & give it ago but Ive not come across whilst shopping before. I need that oil for my scalp! I have yet to give these oils a try but my hair could definitely do with the love! clothing, bags, and bantam leather goods, including more than 500 models of products. It is up to assignation, satisfaction and productive products are completely popular. Would love to try these. Fab Giveaway! I have dry hair! I hope to win!! I would love to win this to say good-bye to bad hair days!